This collective memoir recounts the history of Sergio Tinoco, a migrant worker born in the USA accidentally, and his life as he maneuvers the complicated world of privileges and adventures. The storytelling is light and intuitive, offering a beautiful insight to the world of a maturing American trapped within a completely different frame-of-mind within his grandparents, who had raised him. 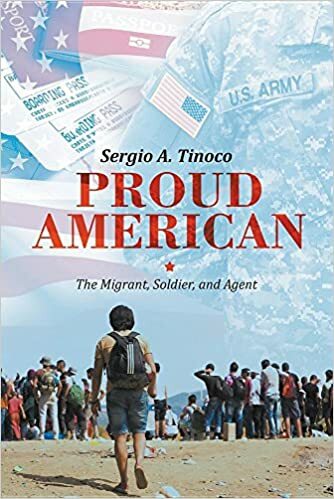 As the years progress through Tinoco’s smooth narrative you see how his growth manifests in impressive ways as he joins the army and continues his life as a strong individual and proud American. A tough beginning gives Sergio a critical and unique insight to the world that is clearly delivered through the narrative of the story, which is a tale about the author’s own beginnings and his growth into an adult. He was born into an immigrant family, having to be raised by his grandparents who were located in the US instead of his biological mother who was stuck in Mexico. One aspect that is heavily played into in the beginning of the story is the itching desire to escape your hometown, your family, and reach a greater place. Most kids and teenagers feel this way, I believe, despite what kind of upbringing they had. It’s inspiring to read how that path opens up for a young soldier with such a rich background. Fear and ambition is a common element in the history of Sergio, and the way he writes really draws readers in and lets them experience the emotions he feels during the twists and turns of his life. There are not many other characters aside from the storyteller, just brief occurrences of names and influences as years pass by in a beautiful trail of words and imagery. The narrative is quite similar to how our real lives unfold, full of minor characters and events that help mold and craft us into the people we stand as today. The same is true for Sergio, and the story is patriotic and full of struggles and achievements that you can share in while reading. Every few pages readers are treated with an image of the author, sometimes accompanied by other family members and friends, or just of an action he has told us about. It’s a great way to connect with his audience and it really helped me get a picture of the life he lived and how it affected him. Since I didn’t have an upbringing or lifestyle even remotely close to what Sergio’s environment, it was very interesting to read about, and I enjoyed the opportunity to learn about things foreign to me. The writing was thought-provoking, and I enjoyed the little instances of humor that were thrown in. Seeing the evolution of Sergio and his mindset over the years as he thinks back was a really enjoyable read, and I loved the way he painted vivid images and made me understand how his mind worked. A truly beautiful story.